Is there a way to take the contents of a DVD and import it into iDVD? I have a home movie on a DVD, and want to make a nice fancy menu and possibly add a beautiful slide show in iDVD and and burn it to another DVD. Does anyone know if there is a way maybe or software to put DVD to iDVD with fastest speed and simple to operate? I am praying for an answer in the affirmative! Thanks in Advance! As we know that Apple iDVD is powerful software that let you premiere the movies and photo slideshows on a professional-quality DVD with animated menus, buttons, scene selection, and dazzling slideshows. With iDVD, you can create own DVDs like a Hollywood DVD just need less time than it takes to watch one DVD, then re-burn it and share them on TV, Mac and PC anytime. However, when Mac users try to import DVD movies to iDVD, but it failed. The main reason is that iDVD can import MP4 format not including DVD formats. If being eager to import DVD movies to iDVD directly, you just need a DVD ripper OS X , which is powerful Mac DVD ripping software that can convert DVD to MP4 format compatible with iDVD directly with the amazing. 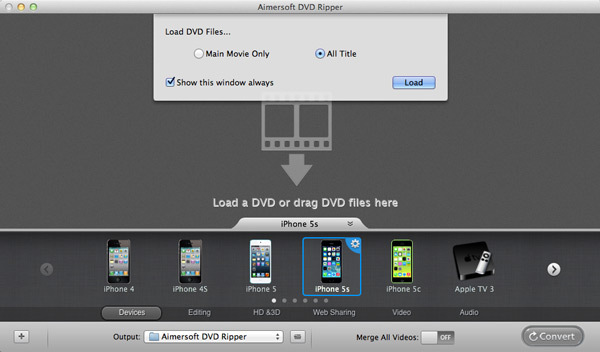 With the Mac DVD Ripper, you can also import DVD to iDVD and other Apple software such as iMovie, iLife directly without any troubling problem. Take action immediately and import DVD Movies to iDVD according to the following1-2-3 step. Insert you DVDs into DVD Drive, then, drag the disc icon you want to import directly to the main surface of the program.Or you can get to "File" Menu on the top , then click "Load DVD" to lead DVD Movies. Click "a small icon" on the right corner, then a small table will pop up, then you can choose "iDVD" listed on Apple software from the drop-down list. After setting the output settings, you can just click the "Convert" button to start ripping your DVD Movies to iDVD. 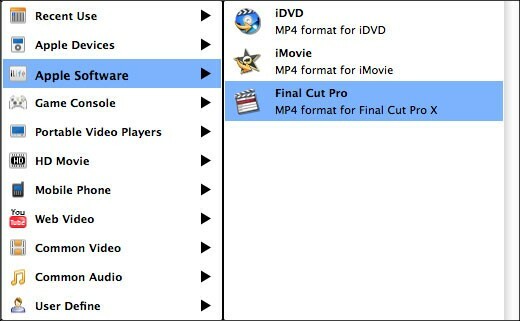 After a few minutes, you will get the converted MP4 format on the Finder. Open iDVD and choose "Magic DVD" and drag the converted MP4 files into "Drop Movies" Here, and then you can edit movies according to your needs. 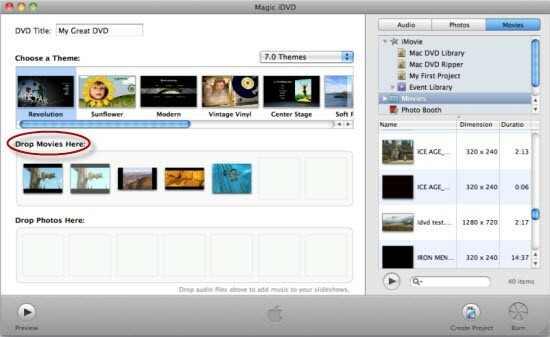 With iDVD on any Mac running Mac OS X El Capitan or other system, you can customize your DVDs such as making a wonderful scene, showing off the nice slideshows, adding the fancy menu and even finishing touches. Then you can re-burn and share them with family on TV, Mac and PC anytime.